Do you know Out Fit & Ltd.? If not you are missing a great company that can make anyone chuckle. Talking Tom & Ben News Free. This app is set up like a real television studio giving students a chance to role play what it might be like on a real set. Students speak and Tom and Ben take turns repeating what you say. If you swipe the characters they swivel in their chairs. Press the dog paw and Ben will annoy Tom. If you press the cat’s paw Tom will annoy Ben. They use water guns and plastic darts to annoy each other. Students can record different shows and play them for the class. This app along with many of the other Out Fit & Ltd. apps have helped foster communication with other students. It helps students with their expressive language either using scripts written by the students or real news. The best part is watching the students laugh when they play with the app. As a teacher it has been the most requested app when there is a choice of an app to use because the students love hearing their voices. 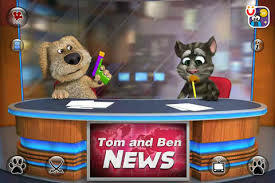 We will incorporate it on Fridays during current events allowing two student to report the news using Tom and Ben. After it is recorded we play it back and critique the kids. It is a creative way to get the quietest student to participate while increasing expressive language and communication skills. Kindergarten.com has been one of the forerunners in developing ABA apps for the iPhone and now for the iPad. ABA Which goes together? is exactly how it sounds. This app can only be played in a vertical position. Next, go to the blue information circle at the top left of the screen to set your settings. First, select your reinforcement and then your Target selection, depending on the child you can do it by category or items the child likes. Next, there are quite a few settings to personalize the app from showing the main question, blink the correct answer, shuffle pictures, show timer, chime sound, show question on the bottom to automatically flip page. Now you are ready to go. 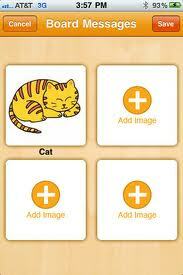 The app presents the child with four everyday pictures and asks which go together? You many see a recycling bin, a pine cone, a raccoon and plastic and glass bottles. When the picture is tapped the child hears the name of the picture. If the pictures go together their is verbal reinforcement asking why do bottles and a recycle bin go together. If you touch the green box with the letter A you get an answer. If you get three answers correct you hear classical music and see your reinforcer. The app helps children on the spectrum work on creative problem solving as well as discrimination and reasoning skills. The white background is purposely created to reduce distraction. The app has now added data tracking to the app. It gives the total time it took for the student to work on the activity. It also gives the total targets, correct answers, incorrect answers and unanswered. This is an important skill for children to understand. Now with tracking time and data it is a must have app. IEP Goals: Student will be able to discriminate with what items go together.